When I moved to Greenwood, South Carolina, I had the opportunity to research the owner of Fairview Cemetery in 1919. It was important because I wanted to know if Beverly Vance (1832-1899) was buried there. He died in 1899. Fairview Cemetery 300 Holman Street, Greenwood, South Carolina, 29649, was named Sodom Cemetery previously. I knew I would research Fairview Cemetery back to that point, but I needed to start with its most recent owner at the time: Joe S. Wah. 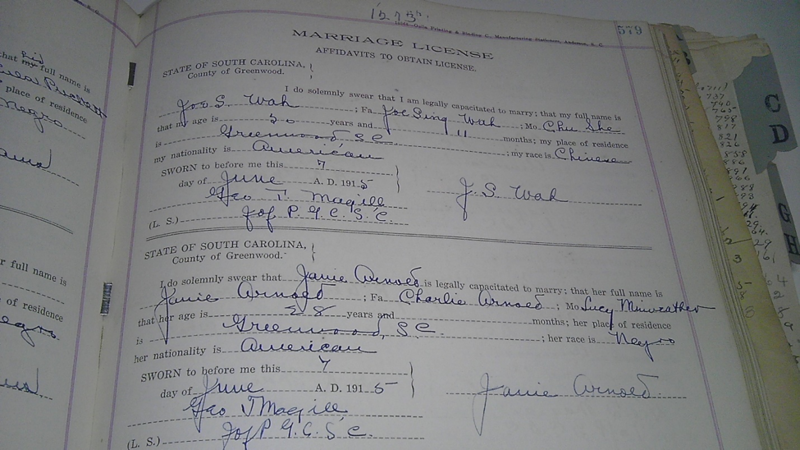 The first surprising bit of information which I came across was that Joe S. Wah was Chinese American, and that he married African American, Janie Arnold Wah June 15th. If you will remember from last week’s post, African American: Are You Working the Cemetery for the Pre-1870 Clues?, Park Arnold, buried at Save All Cemetery, is father to Charlie Arnold. Janie Arnold Wah is his daughter. It became obvious early on that the people interred in Fairview are friends and neighbors and even relatives. Joe S. Wah’s parents, Joe Sing Wah and Chu She, were from China. Janie Arnold’s parents were Charlie Arnold and Lucy Wardlaw Merriweather from Greenwood County. Joe was 20 and Janie was 28. They never had children. Janie had children previously. Joe S. Wah and Janie Wah have several deeds in Greenwood County. I found his name on the Greenwood County – Register of Deeds. 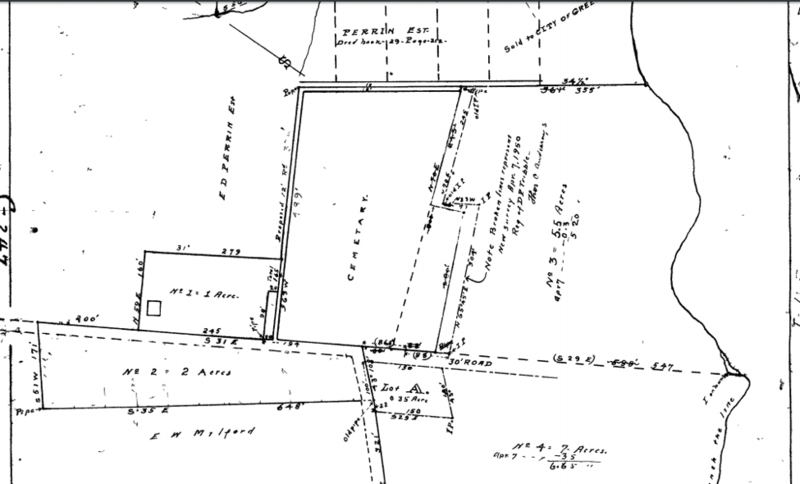 There were deeds in Greenwood County were people purchased plots for family from Joe S. Wah. I cannot tell how my family maintained their plot or if they purchased one from Joe S. Wah, but near the middle of the cemetery is a Johnson family plot. It took me over ten years to find this marker of my 2nd great grandmother, and I had help along the way. 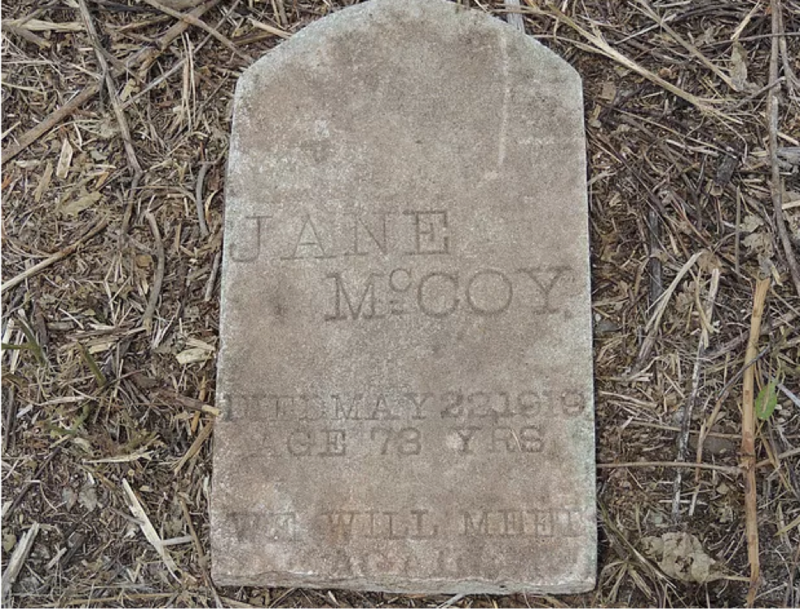 According to oral history, the grave marker of Jane Smith Johnson McCoy was supposed to be in Fairview Cemetery. My family had a reunion in Greenwood many years ago where they remembered seeing it. No evidence of this marker existed in the cemetery at first. No one in the family has been able to produce a photograph taken on their visit to the cemetery. All I had to go on was their oral account from the reunion. I decided the best step to take was to search to see if she had a death certificate. I searched using the name Jane Johnson (Andrew). I could not find a death certificate. I did find her on the 1920 or 1930 Census’ which led me to believe she had passed away sometime before 1920. I did not know she had remarried after her husband, Andrew died. 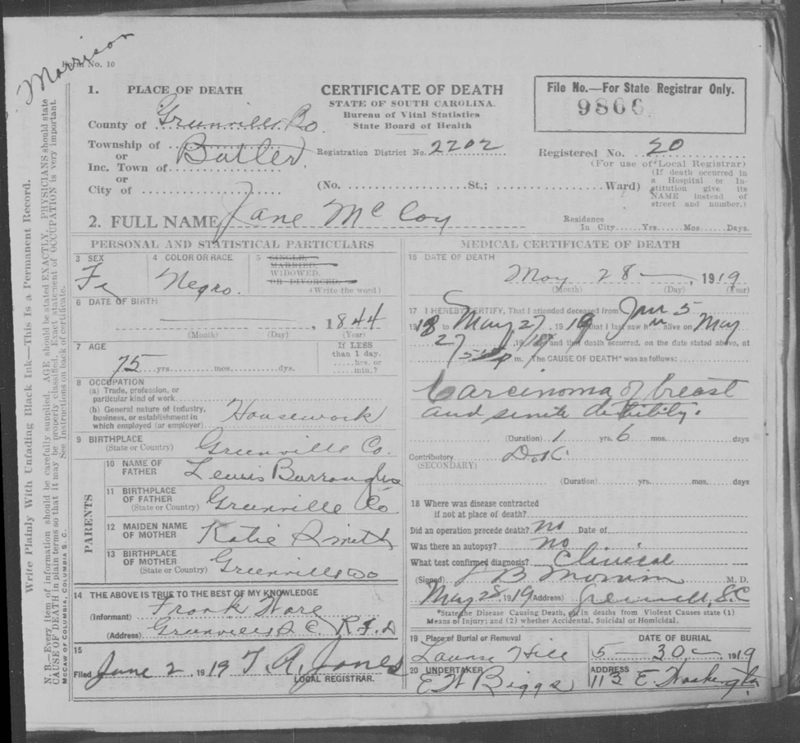 After I discovered the name of her new husband, James McCoy, I did discover a death certificate for Jane McCoy. “South Carolina Deaths, 1915-1965,” database with images, FamilySearch (https://familysearch.org/ark:/61903/3:1:S3HY-6969-T6S?cc=1417492&wc=M6YD-GZQ%3A30404501 : 5 April 2018), 004177352 > image 703 of 1740; Department of Archives and History, State Records Center, Columbia. I learned that she died on May 28. 1919 in Greenville, South Carolina. 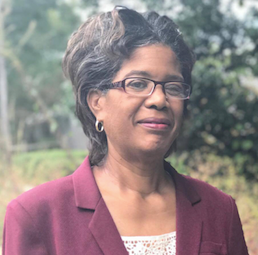 What perplexed me though is the fact that the death certificate shows that she was buried in a cemetery in Greenville, not Fairview Cemetery in Greenwood. So, what was I to make of the account of my family seeing her grave marker in Fairview Cemetery in the Johnson family plot? It was not until the history of another descendant of Jane, the late Senator Frank Gilbert, was shared with me. He surmised that Jane actually had two identical markers in two different cemeteries. He concluded that she probably is not really buried in Fairview but that the marker there was just a memorial to her. At any rate, the first actual physical evidence to me that she existed was found by Jim Ravencraft. 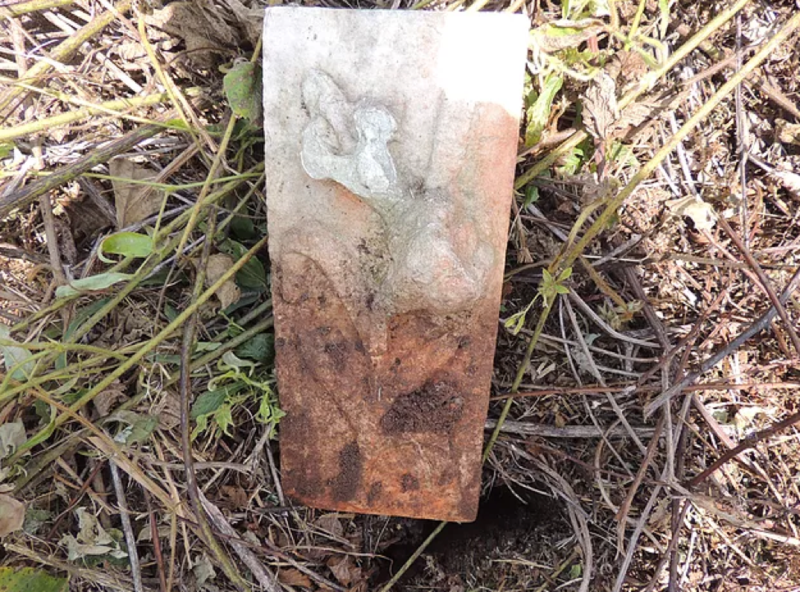 It was laying on the ground in the Johnson family plot like so many other damaged headstones. 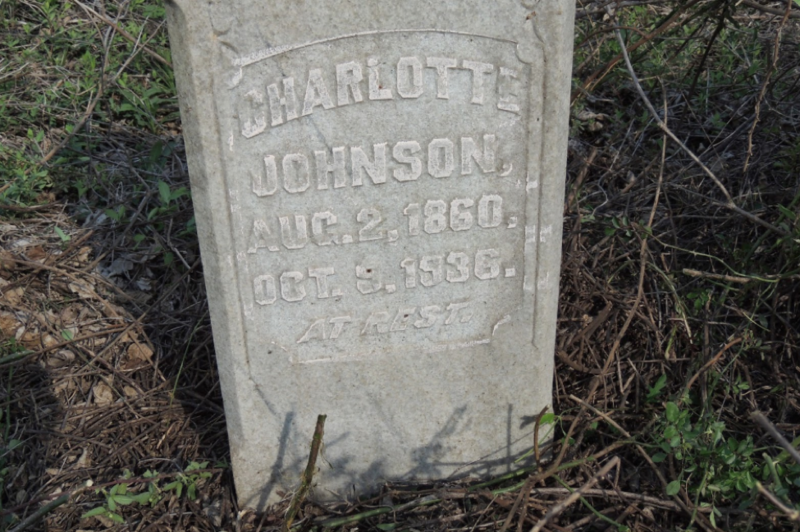 Charlotte Vance Johnson, Beverly’s daughter is buried in the same plot, along with several of her children. One daughter, Essie Mae Johnson Gilbert, is the mother of the late Senator Frank Gilbert. 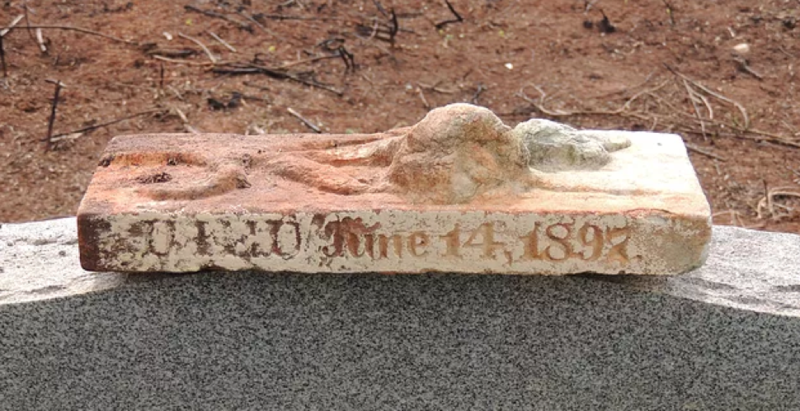 A closer look revealed at least the death date for this unidentified person, June 14th, 1897! Be sure to read the next blog post where we will continue with Joe and Janie Wah. How desperate have you been to identify cemeteries in your family? Would you ever embark on taking on recovering the history of a cemetery because it will help you to identify an ancestor? I learned far more about my family in this process, but there is still the question that remains. Where were Beverly and Matilda Vance buried? I found droves of people from their day in Fairview Cemetery. I will continue. Do you have a similar burning question? Let us know in our Facebook Group.